The Toyota Corolla, Mazda 3 and Hyundai i30 cumulatively claim a bigger chunk of Australia’s new vehicle market than any other trio of rivals. Remarkably, they represent more than one in every 10 sales of not just passenger cars but all vehicles sold across the country, including SUVs, utes, vans and trucks. Recently, the compact Toyota has had its nose in front of Mazda’s small car in the sales race, while Hyundai’s hatch has toiled away close behind. But the sales charts rarely tell the full story, and with literally hundreds of new car shoppers buying these three vehicles each day, they’re all clearly hitting the mark with the market. For this comparison we’ve assembled variants popular with private buyers – each one at least a step up from base grade and equipped with an automatic transmission. Most familiar is the Mazda 3 Maxx, which served admirably for six months on our long-term fleet in Sydney last summer. Priced from $24,390 plus on-road costs, our test car also features the $1500 Safety Pack and metallic paint ($200), options that make it the most expensive car here at $26,090. 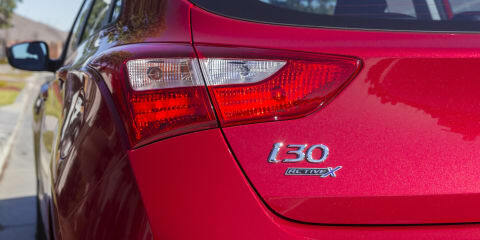 By no coincidence, the recently updated Hyundai i30 Active X matches to the dollar the Mazda’s $24,390 starting price, though optioned only with metallic paint ($495) it’s the most affordable car on test at $24,885. Arguably half a grade higher than the other two is the even more recently refreshed Toyota Corolla SX. Its $25,490 base price makes it the dearest by $1100, though in this test its sole metallic paint option ($450) makes it a $25,940 proposition and the median of the three. Unsurprisingly there are more similarities than differences when comparing the trio’s specification sheets. All come standard with front foglights, a reverse-view camera, cruise control, manual air conditioning, a six-speaker audio system with Bluetooth phone connectivity and audio streaming, AUX and USB inputs, clever Pandora internet radio integration, and premium steering wheel and gear lever coverings. All also get alloy wheels, though the Corolla is unique with its 17-inch rims (3 and i30 get 16s), and all get central touchscreens, though the Hyundai’s 5.0-inch unit looks tiny compared with the 7.0-inch displays of the Japanese duo. The i30’s small screen is also the only one to miss out on satellite navigation, which is one of the car’s biggest disappointments. Hyundai counters by uniquely equipping the Active X with ‘leather-appointed’ upholstery, which isn’t quite the real deal, but looks more premium than the standard cloth in its rivals, and a full-size alloy spare wheel (the others get space-savers). The Corolla is the only one of this bunch with auto on/off headlights and the internet-linked Toyota Link system, which provides access to a number of app-based online services that can find nearby fuel stations, access weather forecasts, and (for a $2.97 per use fee) connect drivers with an operator to help find a destination and then download it to their navigation system. Standard in the other two but absent from the Corolla SX are rear parking sensors. Unique to the Mazda 3 Maxx is the brilliant commander rotary dial, which allows for easy control of the MZD Connect infotainment system without needing to reach for the screen. The system offers expanded internet radio integration to include Stitcher and Aha, as well as a CD player to match the Corolla (the i30 gets a media ripping and storage function instead). Push-button start is another tick for the Mazda, which really only misses out on a driver’s knee airbag in this company. The well-priced Safety Pack pushes the value equation further in the 3’s favour, adding a blind-spot monitor, rear cross-traffic alert system, emergency city auto braking, and an auto-dimming rear-view mirror into the mix. The first big scalp goes to the Mazda here, delivering the best combination of equipment for your cash, while it’s the Hyundai that feels a touch underdone. The Hyundai is in a league of its own for aftersales protection, however. Its five-year, unlimited-kilometre warranty humbles the minimum three-year/100,000km cover offered by Toyota and the three-year, unlimited-kilometre warranty of the Mazda. Hyundai Australia also offers up to 10 years of free roadside assistance if you service your i30 at a Hyundai dealership, where the others charge extra as soon as you leave the showroom. Hyundai and Mazda also provide lifetime capped-price servicing, giving transparency about exactly how much you’ll be asked to fork out at any given interval. Toyota doesn’t offer the same service price guarantees after the first three years of ownership. Assuming the Australian average 15,000km mileage per year over those three years, it’s the i30 that’s cheapest and easiest ($747 for three services), undercutting the Corolla ($840 for six services) and smashing the Mazda 3 ($1230 for four services). The 3 Maxx bounces back at the bowser by being the most fuel efficient car here. Boasting an official combined cycle fuel consumption figure of 5.8 litres per 100 kilometres, it uses 5 per cent less fuel than the Corolla SX and more than 20 per cent less than the i30 Active X. Assuming again that 15,000km per year mileage and an unleaded fuel price of 140 cents per litre, the Mazda will cost $1218 to refuel per year, versus $1281 for the Toyota and $1533 for the Hyundai. Even with these higher fuel costs factored in, it’s clear the Hyundai reverses the standings for ownership considerations, with the Mazda the least impressive and the Corolla again somewhere in between. The Hyundai puts more points on the board behind the B-pillars. Not only is its boot the only one to store a full-size spare beneath its floor, it’s also the largest by some margin. There’s 378 litres of space available with the rear seats in place, versus a modest 308L in the Mazda 3 and a substandard 280L in the Corolla, which is embarrassingly 6L tighter than the size-smaller Toyota Yaris hatchback. The i30’s boot is also the only one with a 12-volt port for powering and charging electrical items. All three feature 60:40 split-folding rear seats, though only the Hyundai’s seat bases flip up to maximise the storage space on offer with the seatbacks pushed forwards. The Hyundai’s is best second row of the bunch, too. Its long, well-angled seat base provides good under-thigh support and is soft and comfortable, while the South Korean also offers a smidge more headroom and matching kneeroom. The Corolla and Mazda 3 both have flatter, shorter seat bases, though they do get a centre armrest with cup holders that the i30 lacks. The 3’s back seat is slightly more comfortable than the Corolla’s, though it’s high window line may restrict the view out for small kids. It’s a different story up front, where Mazda’s designers have created the most driver-centric cockpit of the trio. The 3’s low-set, supportive seat gives the first hints of the hatch’s inherent sporting nature, while racy red stitching, carbonfibre-patterned plastic and satin metal highlights on the steering wheel and beyond add style to the substance. Few familiar with the Corolla’s cabin prior to its facelift could do anything but praise its updated interior. The new touchscreen integrates far more elegantly into the revised centre stack that’s swathed with classy piano black plastic and offset by crisp, ice blue instrument lighting. Body colour-matching orange seat material and stitching look less out of place inside the refreshed Corolla than you may think, with the Scion-inspired SX variant undoubtedly the sportiest looking inside and out of the three assembled for this test. The i30’s cabin lacks the personality of the Corolla and 3, and the smaller, sans sat-nav screen makes it appear the most downmarket of the three. Fortunately, it pleases in a more utilitarian sense with a simple, user-friendly layout and impressive material quality. Hyundai has put effort into the finer details as well as the basics, with the i30 boasting the greatest use of soft-touch materials (including a top-notch roofliner) as well as the biggest storage bins, boxes and beverage holders. Unfortunately, however, you sit on rather than in the plump driver’s seat, though it is at least very soft and quite comfortable. Some little things will niggle the more tech-connected drivers about the i30, such as the necessity to have your phone plugged in via USB to access Pandora through the screen, and the fact that you have to take your left hand off the wheel to answer and end phone calls. The Corolla’s app-based system is the most feature-packed, but also the most complex, requiring you to download a smartphone app and login using the VIN and other details on each phone you want to use to unlock its best functions. And while presenting clearly, the screen’s graphics also look a bit dowdy and old in today’s high-res, iEverything world. In contrast, Mazda’s MZD Connect system nails it on pretty well every front. The floating tablet screen looks neat and modern, and the rotary controller dial positioned perfectly on the centre tunnel makes navigating it a cinch. There’s no app downloading, no logging in and no cable connecting required – just pair and go. It’s the best infotainment system from a non-premium manufacturer on the market, and one half of what makes sitting behind the Mazda 3’s steering wheel such an enjoyable experience. The other half may take place out of sight, but is no less tangible. It begins with the Mazda 3 Maxx’s 2.0-litre four-cylinder petrol engine, which, along with being the most fuel efficient as we saw earlier, is also the largest and most powerful here, producing 114kW at 6000rpm and 200Nm at 4000rpm. The Skyactiv engine’s refinement stands out in this company, revving cleanly and quietly as it accelerates, contrasting most markedly with the Hyundai’s noisier, coarser 1.8. Even better is its six-speed automatic transmission, which shifts quickly and intuitively, impressing particularly in its eagerness to downshift when driving up and down hills and when braking. Driving more enthusiastically reveals even more depth, as the transmission adapts to your inputs, holding onto ratios in a ‘sport mode’-like fashion. Its manual mode is also the only one that will hold ratios against the rev limiter and the only one with its gear lever oriented correctly (pull to upshift, push to downshift). The Hyundai i30 Active X has the least remarkable powertrain of the trio. Producing 107kW at 6500rpm and 175Nm at 4700rpm, it claims a narrow advantage over the Corolla’s equally sized engine on paper (103kW at 6400rpm, 173Nm at 4000rpm) but it doesn’t translate on the road. Across its rev range it lacks the punch of the Toyota, which feels more on par with the Mazda for engine performance. It’s aided admirably by it six-speed auto, which intelligently hangs onto gears or kicks back to lower ratios to keep the engine spinning in the better-performing regions of its rev range. It’s one-dimensional compared with the Mazda’s shifter, however, with a calibration that’s skewed heavily towards economy rather than sporty driving – which would be much easier to swallow if the i30 wasn’t the least fuel efficient car here. That the Toyota Corolla SX has both the sportiest styling and the rortiest engine on this test should go some way to shaking the whitegoods-on-wheels image shamelessly embodied by the latest model’s nearest ancestors. It’s punchy down low and sounds the best of this bunch when revved hard. 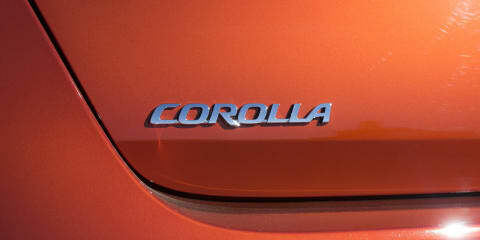 Like the other two gearboxes, the Corolla’s continuously variable transmission partners well with its engine. Cleverly, it features ‘steps’ to mimic gear changes of a conventional automatic, meaning it largely does away with the dreaded drone common among its breed. Fuel consumption figures recorded on test mirrored the official podium, with the Mazda using 8.2L/100km, the Corolla 9.0L/100km and the i30 9.1L/100km. Recently tweaked steering and suspension can’t help lift the i30 above bronze in the dynamics stakes either. In urban environs it feels heavy-footed, thunking over road joins and falling loudly into holes, and picking up bumps and inconsistencies on coarse surfaces. Out of town it exhibits better bump absorption (though the suspension rebound is a bit bouncy) and the ride becomes more settled the higher your speed. The i30’s steering feels slower than its rivals’, and there’s less accuracy and clarity when turned in to corners. There’s little sense of connection to the road, and despite offering reasonable grip, its Hankook Kinergy Eco tyres howl around bends, particularly on smooth surfaces. Much more engaging is the Corolla, which thanks to its recent mechanical overhaul is decidedly more fun to drive than before. The light, sharp steering is excellent on smooth roads, though demands more correction over rougher roads. On those bumpier roads the ride can be a bit fidgety – a trait at least partially attributable to its low-profile Michelin Primacy HP tyres. The thinner rubber is the best here, however, delivering a confident connection with the road in most conditions. For the best all-rounder, though, it’s impossible to go past the Hofu hatch (for those unsure, its production source, not its Urban Dictionary definition). Though firm around town the Mazda 3’s ride is far from uncomfortable, and soaks up bigger bumps with aplomb. Those so inclined will also be treated by the inherent ability of the 3’s chassis, which is a sweet bonus in an unassuming small car. The suspension is the most settled and compliant of the three, while the accurate, consistent steering is also the best here: clearer than the i30, while not as reactive as the Corolla. The Mazda delivers the best connection to the road, sitting flattest through corners and remaining controlled over mid-corner bumps (despite its modest Toyo Nano Energy tyres), while its brakes are more confident than the Hyundai’s and not as grabby as the Toyota’s. It may not quite match the Volkswagen Golf or Peugeot 308 for overall dynamic sophistication or driving fun, but in the context of this comparison, the Mazda 3 boasts a skill set the others can only applaud. There’s little wonder the Toyota Corolla, Mazda 3 and Hyundai i30 sell in such big numbers across the country; they’re all hugely competent, and each has its own unique qualities unrivalled by the others. As such it’s a tight podium that – depending on your priorities – could be subject to some shuffling. Sporty styling, a modern interior with sophisticated infotainment features, a punchy engine and genuinely enjoyable driving characteristics help edge the Corolla one rung higher. Consistency is where the Corolla delivers most, for – with the exception of its tiny boot and flat rear seat – it’s rarely the worst in any area, and produces some pleasant surprises along the way. 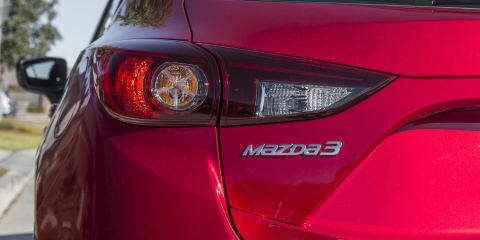 Which leaves the Mazda 3. Being more expensive up front and more expensive to service may sound like big red flags, but few will regret signing on the dotted line for the 3 once it’s in their driveway – or out on the road. The Maxx is the best equipped (even without the optional Safety Pack), has the most driver-focused cabin and the cleverest infotainment system, has the most powerful, refined and fuel-efficient engine, and strikes the best balance of comfort, composure and driving enjoyment. The sales crown may belong to the Corolla, but on this podium, the Mazda 3 is the indisputable champ. Photography and video by Mitchell Oke.